Welcome to our gallery featuring the Valley House by Philip M Dingemanse Architecture + Design. The design of the house follows the contours of the surrounding hills, and is centered in the valley outlook. The principal of the design puts a focus on the kitchen and dining room area. The large openings on either side of this space welcomes guests into the home, while also providing an expansive view of the valley from the interior. To the left of the kitchen and dining area, there is a spacious living room. In the upper quarters, there is a bedroom and full bathroom. On the other end of the home, there are additional living spaces and a garage. 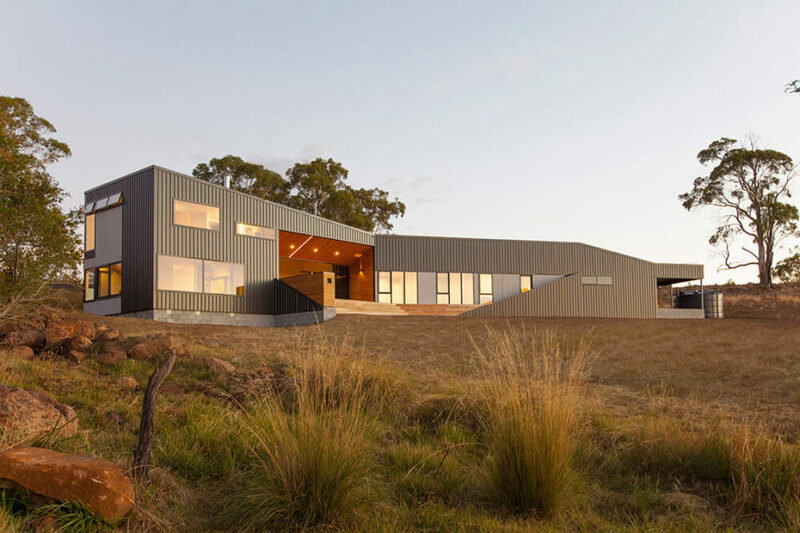 The rooftop gradually lowers from one side of the house to the other, mimicking the shape of the hills in the valley. The rich wood material stays consistent in the majority of the home, with hardwood floors throughout the kitchen and dining area. The paneling on the interior of the living room also is consistent with the patio area. The overall design of the home is stunning, combining functional and necessary features with elements specific to the location of the house. You will notice that even aside from the large patios on both sides of the kitchen space, there are plenty of large windows throughout the home. This helps maximize natural lighting, while also providing breathtaking views in each room. Even with the magnificent interior design, this home features exceptional patio spaces on both sides of the home. The sheltered area provides an outdoor space for lounging even in variable weather. Enjoy the rest of our gallery featuring images of this impressive home, and keep your mind open to design features that could be incorporated into your own space!